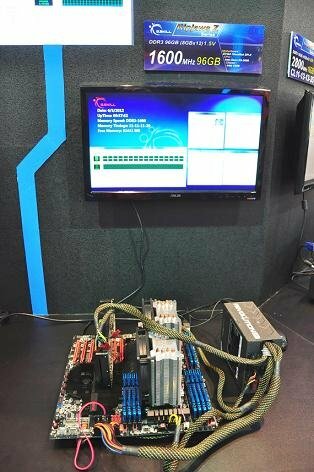 G.Skill revealed a 96GB (8GB x 12) RipjawsZ DDR3 memory kit at Computex. The modules were placed in a EVGA SR-X motherboard and were clocked at 1600MHz. 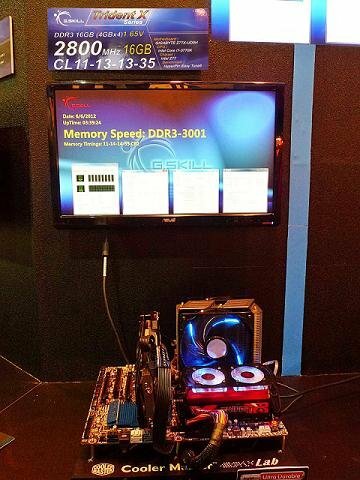 Additionally, G.Skill also showed off its TridentX DDR3 memory achieving 3000MHz! This feat was achieved with a 16GB (4GB x 4) kit and CL11 timings on both ASUS Z77 MAXIMUS V FORMULA and GIGABYTE Z77A-UD5 motherboards.